Please join us for the First Annual Rogoz Memorial Project Tour* of a project developed and constructed by Kraus-Anderson. This project replaces a 40-year old, two-story office building and surface parking lot with creative mixed use complementing East Town Minneapolis and the Elliot Park neighborhood. Elements include Kraus-Anderson headquarters, a five-story, 100,000 s.f. office consolidating three existing KA offices under one roof; “H.Q.,” a 17-story, amenity-rich apartment building along the Portland Avenue residential and cycling corridor; The Elliot, an eight-story Marriott Autograph Collection hotel with 168 guest rooms, restaurant and catering; and the Finnovation Center, a three-story building with Finnegan’s microbrewery, event center and offices for Finnegan’s and other social entrepreneurial business startups. Underground parking, generous landscaping and a green central courtyard will further enhance the new block. The tour will be focused on Kraus-Anderson's headquarters and apartment building. *This new tour series is being named in honor and memory of John Rogoz, former Vice President of Finance at Kraus-Anderson Construction Company. We lost John to a battle with cancer not long ago. His leadership is missed at KA and CFMA TC where John was a key leader. 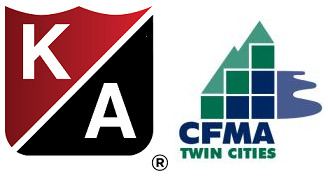 John loved CFMA TC, and regional and national CFMA conferences. There will be happy hour following the tour. The happy hour will be held in the KA headquarters lobby. Our anticipated start time for the Happy Hour is 4:00 pm. If you cannot make it out for the tour, please feel free to register as a happy hour only attendee.